Ride and Read! NEWS by Madness Photography - Onno "Berserk" Wieringa: S&S Cycle Flathead Power Brand Goes Back Home In Sweden To Anders Nygren. 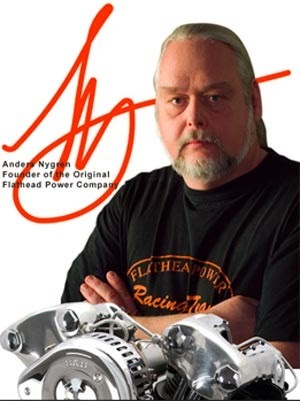 S&S Cycle Flathead Power Brand Goes Back Home In Sweden To Anders Nygren. S&S Cycle Inc. announced today that they are transferring ownership of the Flathead Power® brand back to Anders Nygren, the original founder of the Flathead Power company in Sweden free of charge. “We decided to discontinue using Flathead Power as a brand for our vintage product line about a year ago to consolidate our branding under the S&S Cycle name. We still owned the FHP trademark but had no plans to use it, so we decided to give it back to Anders.” says S&S Company president Paul Langley. Anders Nygren started Flathead Power in Sweden in the early 1990s, mainly to provide impossible to find parts for his own vintage race bikes. His accomplishments as an engine builder and engineer were nothing short of amazing as he, for the most part, single handedly built his fledgling business into an internationally known source for quality reproduction and performance engine parts for vintage Harley-Davidson® motorcycles. Unfortunately, Flathead Power fell victim to a turbulent economy. Anders lost ownership of the name and the company, and Flathead Power was forced out of business. Rather than allow Flathead Power to fade away, S&S Cycle purchased the company name and assets from the new owners in 2007. S&S used the Flathead Power brand for its vintage parts line, but S&S hasn’t forgotten the man who got it all started. “Some folks might question the business wisdom of helping a guy who might eventually become a competitor in the vintage market, but sometimes business decisions need to be influenced by what’s right, and what’s fair, rather than just what’s best for the bottom line.” said Paul Devine S&S Vice President of Sales and Marketing. is effective March 24th, 2015.